Charlie Angell, a river outfitter, offers to take President Trump and his cabinet on a canoe trip through Santa Elena Canyon to show him the folly of a border wall in the Big Bend region. President Trump's executive order calls for an impregnable wall along the border, which includes 118 miles of river shared by the national park and Mexico. But in a rare show of unity, Democrats and Republicans and city and rural officeholders in Texas don't want the wall built through here. Critics say it would be unsightly and prohibitively expensive, it would harm wildlife and that it's superfluous considering how the unforgiving terrain is a natural barrier. Trump has vowed to forge ahead with his border wall despite opposition. His administration plans to select a prototype this summer and hopes to convince Congress to fund it next fiscal year. The administration also acknowledges the wall won't cross all 2,000 miles, though specific plans haven't been released yet. "I would like to invite President Trump or any of his cabinet to come down here. 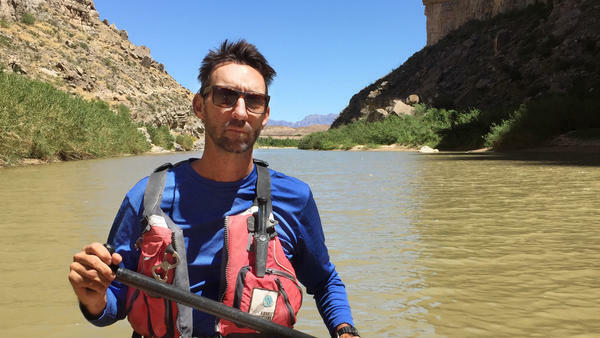 I'll give 'em a free trip on the river, and they can see how unnecessary a wall would be here and the construction and everything involved to create it would just be the worst thing you could ever do," says Charlie Angell, a local outfitter who runs river trips up the canyon. "You might as well take away the park if that happens." Whiskered and sun-bronzed, he stands under a rock ledge, his red canoe beached a short distance away. "I've got the boats, I've got the paddles and life jackets. We'll give [the president] a free lunch. Get out here and see. That way you can cross this area of the border off the list," he says. Even Border Patrol agents are against a wall out here. "For us, we're not pressing the actual brick-and-mortar-style wall here. That's not our objective," says Lee Smith, a career agent and local union president. "We've told everyone from the [Trump] transition team to the current administration, for us here locally in Big Bend, what we need is [more] manpower." While Smith is interviewed in the breakfast room of a motel on Highway 90, a retired electrician from Cleveland eavesdrops from another table. Dave Wickam is just passing through on his Harley — but everybody has an opinion on Trump's border barrier. 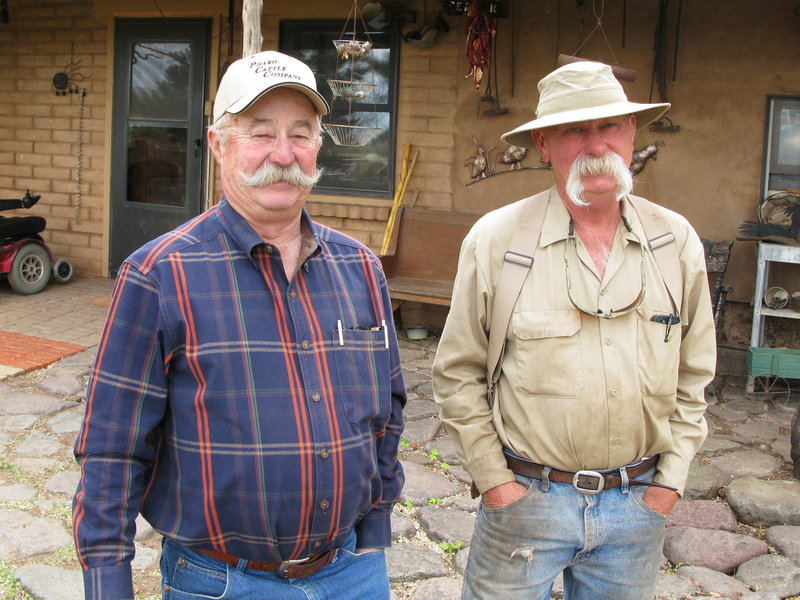 Albert Miller (left) and his brother Bill run cattle on their ranches 10 miles from the Rio Grande and they think the harsh terrain acts as a better deterrent than a manmade barrier ever would. Wickam believes an ugly wall, installed as a quick political fix, would scar the land in perpetuity. "People will build stuff but ... they never tear it down and restore it," he says. "It'll be like Hadrian's Wall in England going across there, but it won't be pretty." Customs and Border Protection has identified sectors in San Diego, Calif., Tucson, Ariz., El Paso, Texas, and the Rio Grande Valley as places where a new wall is needed, but not this lonesome corner of Texas. Along the entire border, the Big Bend sector has had the fewest apprehensions of illegal crossers every year for the past 44 years. Albert and Bill Miller run black angus cattle on ranches that cover an area more than twice the size of Manhattan. Albert Miller knows how hard it is for an immigrant to even reach his land. "They're already crossing 10 miles of inhospitable country and climbing a hundred-foot cliff," he says, his pickup parked in a pasture of bluestem grass about 10 miles from the Rio Grande. He thinks Trump's "big, beautiful wall" is pointless out here. "I can't see that it's going to add anything to the barrier already in place with just the land and the mountains," Miller says. "These guys that are comin', they're crossin' something ... even greater than the wall." The National Park Service declined to comment on the wall. 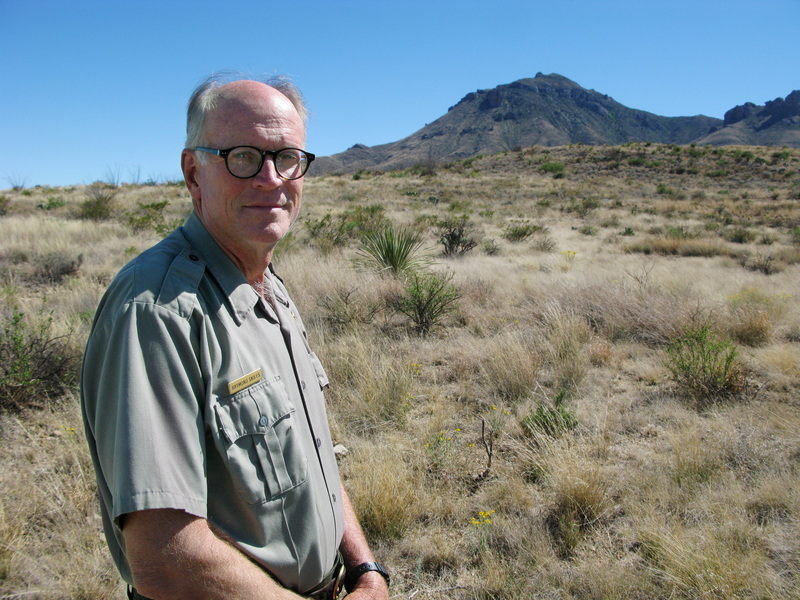 Raymond Skiles, longtime wildlife biologist at Big Bend National Park, says that animals require free access to the Rio Grande as their primary water source. Big Bend's wildlife biologist, Raymond Skiles, only agrees to talk about some of the park's full-time residents: mountain lion, black bear, bighorn sheep and a rare, raccoon-like creature called the white-nosed coati. These mammals range back and forth across the Rio Grande to forage and keep their gene pools healthy. Moreover, Skiles says, in this arid environment they need to be able to get to the river. "The Rio Grande is also the park's most important water source for animals," he says. "It's as simple as that." In February, the Commissioners Court of Brewster County, which encompasses the national park, passed a resolution deeming the wall is unnecessary. This county that voted for Trump concluded it wouldn't make them any safer. "I'm a Brewster County native," says commissioner Betse Esparza. "To imagine a wall in the midst of that landscape, which is beautiful. This is God's country. It's really unimaginable. I don't want to think about it." These naysayers may get a reprieve. Last week, Homeland Security Secretary John Kelly told Bloomberg TV, "There are places we probably won't build a wall," and one of them is Big Bend. President Trump says he is moving ahead with his wall on the U.S.-Mexico border. His administration plans to select a prototype this summer and hopes to convince Congress to fund it the next fiscal year. But the administration also acknowledges the wall will not cross all 2,000 miles. One place nearly everyone agrees it won't go is the starkly beautiful Big Bend region of far west Texas. NPR's John Burnett reports. JOHN BURNETT, BYLINE: Of all the wild places along the southwest border, Big Bend National Park named for the great curve of the river is the gem. CHARLIE ANGELL: Hello down there. BURNETT: Here in Santa Elena Canyon, the international river flows between 1,500-foot walls of limestone - a study in light, shadow water and time. ANGELL: My name is Charlie Angell. My outfit is Angell Expeditions. We do - we're outfitters in the Big Bend of Texas, headquartered in Redford on the banks of the Rio Grande. BURNETT: Angell is whiskered and sun-bronzed. He stands under a rock ledge, his red canoe beached a short distance away. ANGELL: I would like to invite President Trump or any of his cabinet to come down here. I'll give him a free trip on the river here, and they can see how unnecessary a wall would be here and that the construction and everything involved to create it would just be - it would be the worst thing you could ever do. You might as well take away the park if that happens. I've got the boats. I've got the paddles and lifejackets. We'll give you free lunch. Just get out here and see. That way you can cross this area of the border off the list. BURNETT: The Big Bend Region where the ghostly Chisos Mountains rise out of the prickly Chihuahuan Desert is sacred ground. The writer Marion Winik once called it, what I imagine the mind of God looks like. Trump's executive order calls for an impregnable wall along the entire border, including 118 miles of river between the Big Bend and Mexico. This is one of the few things that unites Democrat and Republican, city and rural officeholders in Texas. Nobody it seems wants it built through here. Critics say a fence would be unsightly and prohibitively expensive. It would harm wildlife. And it's superfluous considering how the unforgiving terrain is a natural barrier. Even border patrol agents are against the wall out here, says career agent and local union official Lee Smith. LEE SMITH: For us, we're not pressing the actual brick-and-mortar style wall here. That's not our objective. We've told everyone from the transition team to the current administration, for us, here locally in Big Bend, what we need is manpower. BURNETT: We're talking in the breakfast room of a motel on Highway 90. A retired electrician from Cleveland named Dave Wickam who's riding his Harley across the southwest has been eavesdropping from his table. He believes an ugly wall installed as a quick political fix would scar the land in perpetuity. DAVE WICKAM: People will build stuff, but they'll never take it back. They never tear it down and restore it. It'll be like Hadrian's Wall in England going across there, but it won't be pretty. BURNETT: Customs and Border Protection has identified sectors in San Diego, Tucson, El Paso and the Rio Grande Valley as places where a new wall is needed but not this lonesome corner of Texas. Along the entire border, the Big Bend sector has had the fewest apprehensions of illegal crossers every year for the past 44 years. Albert and Bill Miller run Black Angus cattle on their ranches that cover an area more than twice the size of Manhattan. Albert Miller knows how hard it is for an immigrant to even reach their land. ALBERT MILLER: They're already crossing 10 miles of very inhospitable country and climbing a hundred-foot cliff on the back. BURNETT: Miller parks his pickup in a pasture of bluestem grass about 10 miles from the Rio Grande. He thinks Trump's big beautiful wall is pointless out here. MILLER: I can't see that it's going to add anything to the barrier already in place with just the land and the mountains. And these guys are coming - they're crossing something - already something even greater than the wall. BURNETT: The National Park Service declined to comment on the wall. Big Bend's wildlife biologist Raymond Skiles only agreed to talk about some of the park's full-time residents - mountain lion, black bear, bighorn sheep and a raccoon-like creature called the white-nosed coati. These mammals range back and forth across the Rio Grande to forage and keep their gene pools healthy. Moreover, Skiles says in this arid environment, they need to be able to get to the river. RAYMOND SKILES: The Rio Grande is also the park's most important water source for animals. It's as simple as that. BURNETT: In February, the Commissioners Court of Brewster County, which encompasses the National Park, passed a resolution. This county that voted for Trump concluded the wall is unnecessary and would not make them safer. Commissioner Betse Esparza. BETSE ESPARZA: I'm a Brewster County native. To imagine a wall in the midst of that landscape which is beautiful - this is God's country. It's really unimaginable. I don't even - I don't want to think about it. BURNETT: These naysayers may get a reprieve. Last week, Homeland Security Secretary John Kelly told Bloomberg TV there are places we probably will not build a wall, and one of them is Big Bend. John Burnett, NPR News, along the Big Bend of west Texas. Transcript provided by NPR, Copyright NPR.